Below I have listed our 2011 Corriedale blend rovings for sale, produced with wool from our own farm flock of sheep combined with other Michigan fibers - alpaca, kid mohair, angora bunny. Some may include pygora, silk and even sparkly bits of angelina. 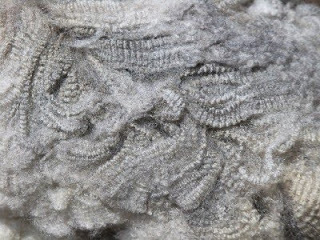 All were processed at Zeilingers Wool Mill, also here in Michigan. 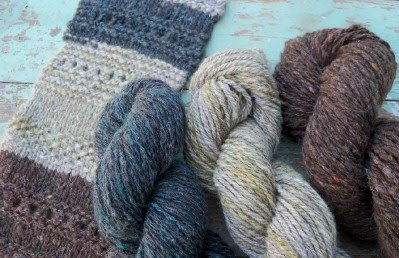 The photo above shows samples of yarn and fiber produced from some of these rovings (yarn from left to right is Midnight Dances, Pasture Land and Michigan Red Cedar). 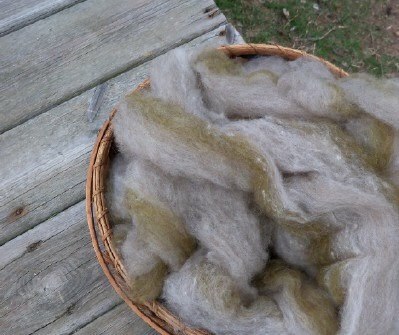 If you are interested in any of these fibers, we accept cash, check or money order or Paypal. Prices listed do not include shipping. Please contact us for availability, price quote with shipping to you, or any questions you might have about the fiber. We also offer discounts for large lot purchases (multiple pounds) or we will sell in 8 ounce bumps for $15 plus shipping, except for combed top - that is priced seperately below. 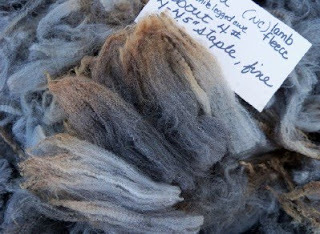 If you are local to us in Michigan we would be happy to have you visit the farm to pick up your fibers and meet the sheep in person! We can be reached by email at serenityfarmswool at yahoo dot com or by phone at 989-463-5630. Thank you for your interest in our family farm product! 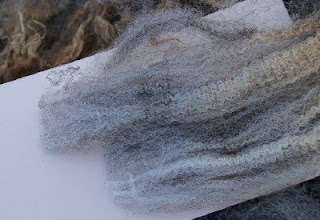 Nearly black (charcoal shot with silver), very fine lambswool blended with black-grey kid mohair and black alpaca highlighted with dyed turquoise and navy silk plus jewel-toned sparkly angelina. I was disappointed to find a lot of noil occurred in the processing of this fiber, but then delighted in the rustic tweedy texture of the yarn (another sample photo below)! 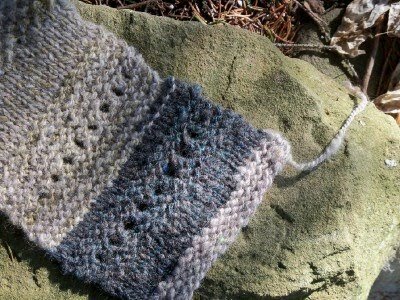 I am currently making a shawl out of this - it is gorgeous! In very early spring, after the snow has melted away, the first bits of new pasture growth begins to peek through the over wintered, now brown grasses. 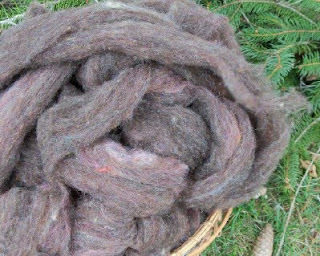 This roving is from our perennial favorite ewe Violet. 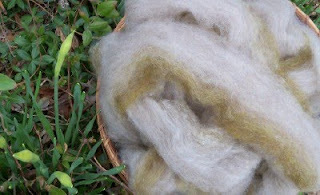 Her taupe colored wool is blended with a pale red kid mohair fleece, angora bunny, undyed silk and more wool dyed in shades of warm greens (think olive and sage). Even though my inspiration for this was early spring, I think of it as a "warm" blend. About three pounds, $28 per pound. 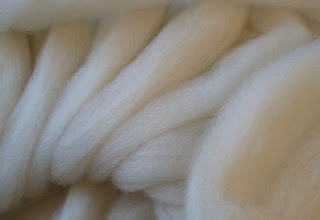 This makes a particulary grand 3-ply yarn and I don't think you'll be disappointed if you give it a try! 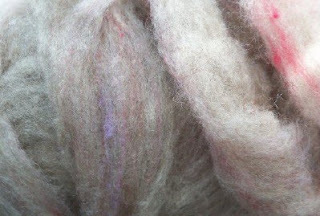 Inspired by the beauty of a spring dawn, this roving includes natural pale grey Corriedale wool blended with angora bunny and highlighted with dyed Corriedale and pygora in flashes of purple, pinks and violet blue. 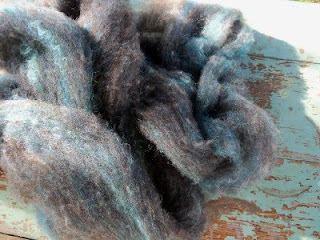 This roving is soooo soft! I don't have a picture of a sample yarn for this one, but it is nice Two pounds available at $28 per pound. Listed below are just a few of the fleeces we still have available for sale. 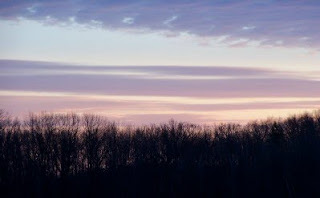 I will be posting more as time allows throughout the week. If you see something you like that has already sold, please contact me as we may have something similar still in stock or you can always be placed on the Reserve list for 2012!